Mount Saint Mary College professors and staff recently presented their papers at the 14th Biennial Colloquium of Dominican Colleges and Universities. Left to right, Charles Zola, director of the Mount’s Catholic and Dominican Institute, philosophy division chair, and associate professor of philosophy; Barbara Petruzzelli, director of the Kaplan Family Library and Learning Center; Megan Morrissey, academic coach; Sr. Janet Marchesani, OP, former Mount adjunct for American Sign Language; Gina Evers, director of the Mount’s Writing Center; Ilona McGuiness, vice president for Academic Affairs; and Patrick Duffy, academic coach. 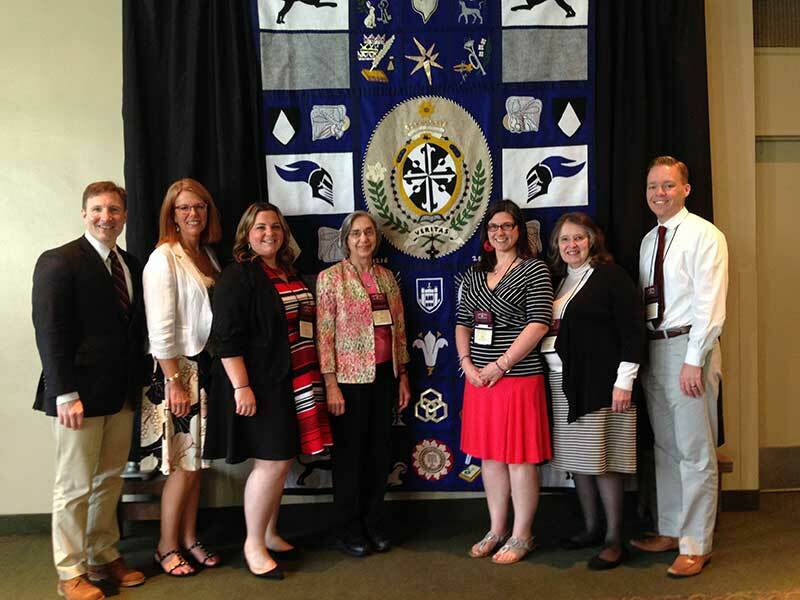 NEWBURGH, N.Y. – July 2016 – Faculty and staff from Mount Saint Mary College recently presented at the 14th Biennial Colloquium of Dominican Colleges and Universities. Hosted at Aquinas College in Grand Rapids, Mich., the colloquium provided faculty, students, and professionals of Dominican colleges and universities the opportunity to reflect on the rich heritage of the Dominican Order – which is currently celebrating 800 years of faith and fellowship – and discuss important issues presented in Catholic Dominican higher education. Also in attendance was Ilona M. McGuiness, the Mount’s vice president for Academic Affairs. One of the strengths of the colloquium was its diversity, explained Evers. The completed Jubilee Quilt, created by the Mount Saint Mary College community, celebrates 800 years of the Dominican Order. Mount professors and staff proudly displayed the quilt during the recent 14thBiennial Colloquium of Dominican Colleges and Universities. Photo by Lee Ferris. 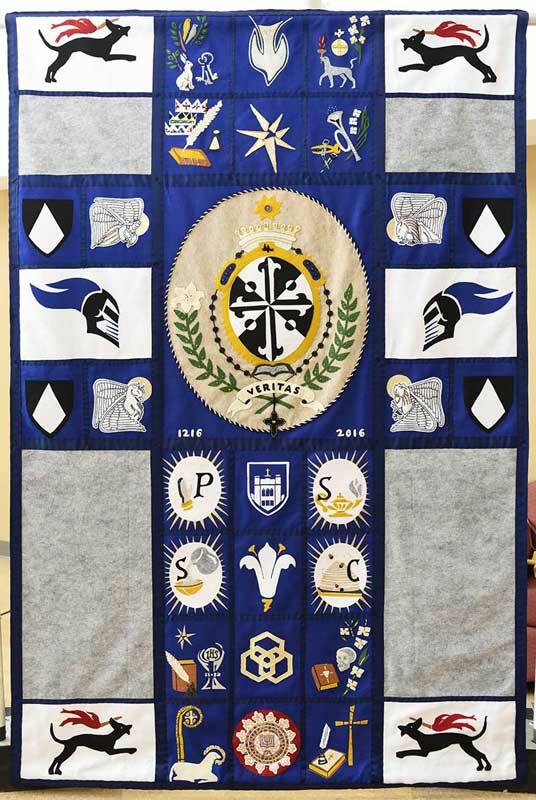 The Mount presenters were also proud to display the college’s recently completed quilt commemorating the 800th Jubilee of the Dominican Order. From faculty and staff to students and alumni, members of the Mount community joined forces to create the piece, which celebrates the rich history and charisms of the Dominican Order and honors the Mount’s connection. The quilt was inspired by the art of the Saint John’s Bible – the first handwritten and illuminated Bible produced in more than 500 years. Through a sharing program with St. John’s University, the Mount community has enjoyed living and learning with two fine art reproduction volumes of the Saint John’s Bible over the last academic year. The Dominican Sisters founded Mount Saint Mary College in Newburgh, N.Y. in 1959, using as a guideline the four pillars of Dominican life: study, prayer, service, and community. St. Dominic established the first community of the Order of Preachers in the 13th century. The Jubilee Quilt was created under the direction of Laura Nicholls, Mount Desmond Campus art instructor, certified calligrapher, and former art teacher at St. Thomas Aquinas College and in the Nanuet Public Schools. The project was co-sponsored by the Catholic and Dominican Institute and the Saint John’s Bible Planning Team.